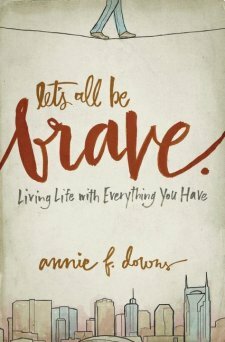 You will notice, these Perfectly Unique letters, drawn from the book by Annie F Downs, are quite short and simple. I often struggle between being too wordy, and too abrupt. In these letters, I wanted the message to be true and rich, but my words to be few. Hopefully I have achieved a balance. Several letter writing ideas swirl in my mind often, but getting them down on paper isn’t always done before I forget those great ideas. Understanding that about myself, I began to be intentional about looking for an idea for a series of letters to pre-write to our Compassion Sponsored Children. 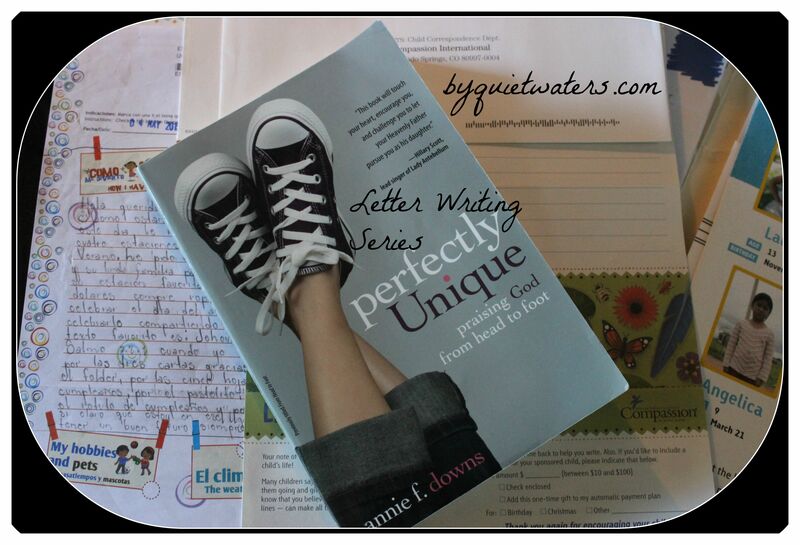 These letters are among the most popular posts on By Quiet Waters. My younger daughters and I love Annie Downs. She is another “big sister”. It has been a tremendous blessing to read her books together, alongside and/or one after the other. How ever her books are read around here, loads of conversation follows. Last week I posted my goals for the week and found that it was much simpler than using the spiral notebook. While the list was a little out of sight and out of mind at times, I wasn’t carrying it around and continually adding to it. That is something I had been doing that was adding to my frustration. The list was never complete because I was adding to it and copying it every few days as the page became full! Read 5 chapters of Love Does aloud. Read a picture book each day with my granddaughter. Write a love note to Ben. Clean the dresser top in our bedroom. Finish reading Undaunted, Say GoodBye to Survival Mode and Alone, Yet Not Alone. I refined the goals just a little. During the fullness of the week I realized that reading aloud 5 chapters is a stretch, the same with the picture books. Read 3 chapters of Love Does aloud. Read with my granddaughter. I am going…to (in)RL 2014, or at least registered and planning to. I got so nervous after registering and finding a local meet up, that I clicked off the page before joining the meetup! I am wondering…where our family is going to end up as this season comes to a close. My beloved has worked away from home, renting homes and apartments where my name isn’t on the lease, for several years. This weekend we were asked to “put a stake in the ground” for our marriage. My stake in the ground was named “under the same roof”. I am looking forward to…Co-op classes! And Valentine’s Day. I have a different menu planned from our traditional one and am looking for a movie to watch that deviates from the same one for the last 10 years (Lady and the Tramp). Any suggestions for a good chick flick that is clean and pure? Around the house…quiet as my daughters work on their school lessons. And tidiness. The 2 who were home all weekend while the rest of us were away cleaned several rooms!